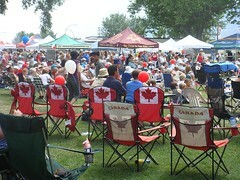 For the 3rd year running we held a block party to celebrate Canada’s birthday and our incredible good fortune at being able to reside in the country’s best town and province – Penticton, British Columbia. OK, so maybe we’re just a little biased, but hey, the word ‘Penticton‘, derived from a word in the Okanagan language, means “a place to stay forever” and such claims aren’t made lightly. Personally, I refer to it as ‘Perfection, British Columbia‘. Mountains, big lakes and hot dry weather that give us cherries and wine as well as opportunities for hiking, biking and boating … what more could anyone ask for? 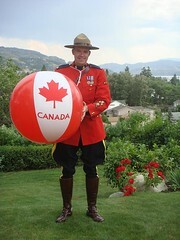 Anyway, in the party invitation, I’d warned folks that our good friend and neighbour RCMP Constable Marty would “be on hand to serve and protect prudish Canadian dignity, so please bring bathing attire and a towel if you plan to use the pool“, but I didn’t expect that he would show up completely decked out in his RCMP red serge uniform. Many thanks to Martin for such a wonderful and fun surprise – especially considering the 34C (93F) temperatures!! For the ladies, there’s nothing quite like a man in uniform (Martin cuts a truly fine figure) and the guys were all agog over his numerous service badges. We’ll just ignore the fact that he returned sporting a Montreal Canadiens hockey jersey to counter Ed’s Toronto Maple Leaf’s deck chair. That evening we enjoyed good food and fun with our neighbours and friends and then spent Canada Day taking in the festivities around Penticton and Naramata. As ever, there were bands entertaining the crowds in Gyro Park, a climbing wall as well as all the usual food concessions, including the not-to-be-missed Mimi’s Mini Donuts.